In the Rake magazine issue of December 2005 I read Jennifer Vogel’s exegesis on the religiosity of Eric Enstrom’s “Grace” (“That Old-Time Religion,” pp. 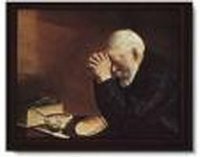 23-25; one version of the image is reproduced above); it is good for us to have such an abject image of humility in a season–nay, a yearlong culture–of conspicuous consumption. I was disappointed, however, by the omission of the fact that Enstrom’s work, or some tinted, altered, photomechanical descendant of it, is the state photograph of Minnesota. Among our state’s many symbols–loons, pink-and-white lady slippers, blueberry muffins–is this very image, and we are unique in the nation in having an official state photograph. A copy of it hangs in the Secretary of State’s office, by order of state legislation. (Whether it’s a gelatin silver print or some non-photographic process is not clear, and deserves further investigation in order to be sure we’re not misrepresenting ourselves or mislabeling our symbols.) We are, officially, a “state of Grace,” and Enstrom’s contested, reconfigured version of it truly does, as Vogel states, “belong to everyone” in the land of 10,000 reflective surfaces. We’re also graced with lots of great photographers, though I don’t believe our god-fearing leaders meant to celebrate this population in their choice of this symbol. For further reference–I’ve written at greater length about the “Grace” issue in a 2002 feature on mnartists.org; you can find it here.